NextGen Gaming are renowned for developing eye-catching slot machines with unique themes, and the Butterflies slot machine is yet another one as it focuses on the beautiful butterfly – with wins that will leave you feeling like you’re flying high in the sky just like them! The stunning and tranquil location has been designed in the style of a cartoon background and it is reminiscent of a nature park as you’ll wander across lush green grass which is dotted with colourful flowers growing, with a clear blue sky so you can easily spot the butterflies flying around. If you usually have butterflies in your stomach when you play online slots for money, you’ll have even more playing the Butterflies slot machine as there are huge rewards on offer for spotting them flying with their large and bright coloured wings – with a jackpot of 7,000 coins on offer for identifying a group of five at once. 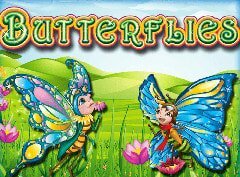 Butterflies is a 5-reeled slot machine containing 20 adjustable paylines with a 95.36% return to player percentage advertised on the paytable, and as with how online slots usually work, there is also an autoplay feature enabling you to spin the reels from five times up to five hundred to save you clicking the spin button each and every time. While it is rather basic compared to other slots in NextGen Gaming’s extensive game library, there is a Wild Butterfly feature which sees additional positions become Wild and a gamble feature for when you are feeling lucky and want to risk increasing your winnings. The symbols that NextGen Gaming have designed for the Butterflies slot machine are equally as stunning as the setting in which the action takes place, boasting bright and vivid colours. The symbol which appears to be a chrysalis has been titled as the House symbol and this is the Wild symbol with the ability to substitute for all others aside from the Scatter. Although this symbol only appears on the first reel, whenever it does you’ll be in for a treat with the Wild Butterfly feature which you can learn more about below. The beautiful pink flower is the Scatter symbol and whenever two or more of these land anywhere on the reels at once you’ll be treated to instant Scatter wins which can be very large indeed. Two of these earn you 2x your stake, three bring 5x your stake, four and it’s a lovely 20x your stake, and five bring the ultimate reward of 100x your stake. Of the rest of the symbols there are two butterflies, one which is facing left and one which is facing right. The one facing left is the highest-valued symbol of all with five of these appearing on a payline resulting in a massive win worth 7,000 coins, plus these bring rewards for landing two on a payline. You’ll also encounter a cute caterpillar, a large mushroom, and Ace to 9 icons. Whenever the House (Wild) symbol lands on the first reel the reels transform from day time to evening time with your view of the landscape becoming dark with stars sparkling in the sky. You will then see a butterfly hatch from the house and fly onto the reels before resting on random reel positions before fluttering away, with the positions that it lands on being transformed into Wilds before the reels are re-evaluated for greater rewards. If you’re feeling lucky and in a brave mood you will also have the opportunity to activate a gamble feature after every winning combination in an attempt to further increase the value of your winnings by either doubling or quadrupling them. In order to double your winnings, you simply have to decide whether the next playing card to be revealed will be red or black in colour, while to quadruple them requires the tougher task of selecting the suit that it will be (heart, diamond, spade or club), but be careful not to get too greedy or your winnings will fly away never to be seen again! While the Butterflies slot machine lacks in bonus feature and it’s pretty disappointing that there is no free spins mode or second screen bonus games, Butterflies is an eye-catching slot machine thanks to the stunning design and there are huge wins to be had in the base game which makes up for this, and should you be lucky enough to land five butterflies on a single line you’ll certainly have flutters yourself!